Trip participants: Trevor and Barbara (Leaders), Peter and Lynn, Julie and Trevor, Deb and Bruce, Jenny and Barry. Barry and I were up early and off by 7:15. We had to be in Salisbury about 8 for an 8:30 departure. We had plenty of time. Of course, we don’t often drive at that hour and traffic was a bit heavier than anticipated. Turns out we got there at 8:15 and were last. Didn’t really matter though as I had planned on doing the trip report anyway. Once the paperwork was done, we were off. Heading north via Clare we found ourselves in Jamieson right on morning tea time. Thankfully they have a well stocked bakery, plus plenty of parking, right on the main road. After a brief stop for coffee and treats we carried on. It’s always nice to wind our way through the hills towards the Flinders. The area is robust and beautiful. After a few emu sightings, we were in Hawker by lunchtime, needing fuel for both cars and drivers. We decided to stay on the bitumen until Parachilna where we stopped to book a table for Saturday night dinner. 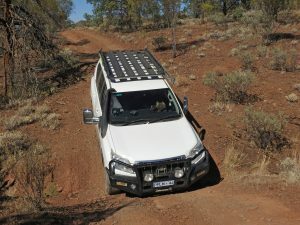 After letting tyres down, we headed towards Glass Gorge Road, and Oratunga Station, to find our campsite. Our club has a history with the Oratunga property. 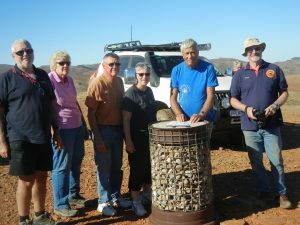 Ralph Abbot leads the cactus cull program on Oratunga, and many club members have helped out over the years. With gratitude and thanks, Ginny, the owner, has offered us the use of the camp sites along the Oratunga Creek. The area is rugged, quiet, private, and has the added bonus of being reached by dirt track, or river bed – whichever suits you. 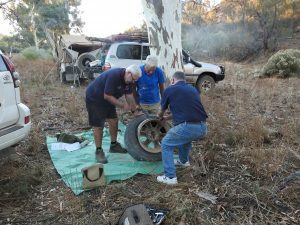 Not far from our camp turnoff, Goldie had a tyre puncture. Once changed, we carried on and got to camp mid afternoon, leaving plenty of time to unpack our trailer full of firewood, set up camp, and repair the tyre. It was now needed for his spare. A quiet night, and as we were all a bit done, we headed to bed early, with alarms set for a 7am wakeup. It’s Skytrek Day and we have to be ready to go by 8:30. It’s a bit of a drive to the Willow Springs Station and we have to be there before 10:30 to start the track. Some had done this track before, but it has been changed recently so we were looking forward to driving the new route. We were each given a booklet outlining the track. There are 50 points of interest noted, with sign number and odometer reading, giving a brief description of what we were looking at. The included map was useful for position of huts and loos, which helped with planning for morning tea and lunch. The track meanders through the property passing several bores, yards and huts. While interesting, we were looking forward to engaging low range and doing some challenging driving. The anticipated tougher route is towards the end of the circuit, with four wheel drive recommended from point 44 onwards. We climbed up the steep terrain for some fab views, and while not difficult, the drive was certainly more interesting now. The caretaker said the whole circuit would take 7-8 hours, which, including the drive home, would get us back very late. Of course, you know us. We had plenty of time to see everything, managed the harder bit with ease, and were back at the homestead in 6 hours. Those who had driven Skytrek previously thought the old route was steeper and more challenging, although today’s track was still pretty good. Only a couple of little troubles today: Goldie lost a mudflap, which Peter recovered, and Peter bent his sidestep up a bit. It can be straightened. One other trouble: the infamous ice cream lie. Barry promised everyone an ice cream at the homestead as we were finished a bit early. Only problem: they don’t have ice creams. Or had they hid the previously imagined ice cream freezer while we were driving? No one knows for sure. We got back while still light for tea and a campfire. And another early night. Alarms on? 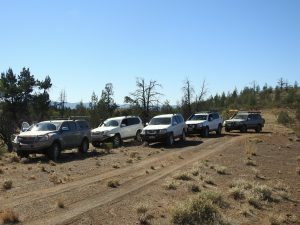 Chambers Gorge and Market Garden Day had us all ready to go by 8:30. 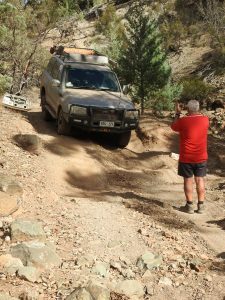 Like yesterday we had a bit of a drive on dirt roads and bitumen to get to Chambers Gorge. After a brief morning tea, we walked to see the rock art preserved within the gorge. It was an easy walk along the creek bed past numerous small holes, dug by the many goats, accessing the water 10 to 20 cm below the sand surface. There is a sign explaining the meaning of each art shape at the entrance to the area. Trying to remember these whilst looking at all the etching was a task. There is lots of art which would have taken years to etch. Next stop was to be the Market Garden developed and run by Trevor Burford’s great grandfather, Charles Roberts, owner of the North Star Hotel in South Blinman circa 1840’s. At that time the town of Blinman was approximately 2000 people, and he grew fruit and veg for the whole community. We took the Nerrina Road to Erina Waters and towards the garden site. The creek bed in was a bit rough and challenging, so lunch was called. It was a lovely spot to stop in the shade beside a creek which, when running, must be beautiful. Complete with rock pools for a dip I’d imagine. But not today. After lunch, we continued through the creek and not much further in distance, but a few challenges later, we found the garden site. Trevor showed us around and explained the history of his family in the area. It would have been a lot of work to grow, gather, and transport the goods to town, but with the large creek bed adjacent, water must have been plentiful in season. It was very interesting, and according to some, the better drive of the day. The creek bed looked challenging and a full day exploring the area would be great next time. We popped in to Angorichina Village for fuel and ice cream – they did have ice cream here. Goldie considered buying a tyre just in case, but decided to hold off for now. We were back to camp early enough to get some good coals ready for camp oven roasts. Bruce and Deb had arrived, and were practically set up. A nice tea by the fire, and another alarm set for morning. This morning, after another 8:30 start, we made our way by bitumen to Beltana, then up the track to Warraweena, to do the Copper Track. Stoney, the manager, was pleased to see us all again, and once caught up and paperwork done, we headed off. After a quick morning tea near the homestead, we started on the track towards the Nuccalina Copper mine. According to Stoney, the Northern Flinders has had a lot of rain over summer and many of the creek beds, although dry, have much steeper entries and exits than in previous years. We were looking forward to seeing for ourselves. Several of us had done this track a couple of years ago, with campers on, and had found it easy going with a couple of exceptions: Barb’s tree comes to mind. When the angle available is just less than the angle required….enough said. Today we found the track to be very enjoyable. No real problems, and luckily no damage. The creek entries were steeper, and a couple of exits quite tricky, but overall just a nice day for a good drive in the Flinders. We were back at camp early enough for a quiet coffee in the shade ahead of drinks and nibbles at 4:30 to celebrate the Goldies 44th Wedding Anniversary. Well done you two. And thanks for catering the event. After tea by the fire, many went to bed early. Those of us still up were joined by a very curious, and not very scared, fox. He circled round the camp time and time again, ignoring our torches, even ignoring those who followed him around. Brave little fella. We had a little sleep in today – we are waiting for Ginny and her guests, Lisa and Medina from Sweden, to arrive about 10ish for a tour of Oratunga and the surrounding area. We anticipate a short day, followed by hot showers and tea at the Parachilna pub. Kind of like a day off. Ginny arrived just after 10, and with introductions, and a quick tour of our camp completed, we were underway. Back along Glass Gorge Road, which runs through Oratunga, Ginny relayed the history of the area. First stop was at First Spring, where after a short walk, we came to a cascade of pools, home for lots of little frogs. This spring has been fenced in an attempt to keep the goats out as the government is doing a study of the effects they have on the environment. There were lots of goats around. As part of a worldwide art installation, atop a small hill adjacent to Glass Gorge Road, is a monument and a circle of stones. There are three stone tablets in the area, telling the story of a parallel universe, and people from all over the world trek to see these art sites. Truthfully, I didn’t get it, but if you would like to know more please look up Kcymaerxthaere. Entering Glass Gorge itself, Ginny told us about George Glass, the man who settled and built in the Gorge. His windmill and a couple of out buildings can still be seen beside the creek. A lovely spot for lunch. Ginny invited us back to her place for a cup and tea and lemon myrtle biscuits, and a chat. As we had to get home for showers, and she had to work with the plumber who had finally arrived, we said thank you and moved along…..only to find two cars on the side of the track needing help. The young couple had a flat, and couldn’t disengage the spare from under the tray. The older couple, who had stopped to help, were none. So we three vehicles stopped, and with tarps, tools and knowledge, and a bit of brute strength provided, the task was done. On the way back to camp, we decided to detour via the creek bed. The Oratunga Creek is wide and long, flowing across Glass Gorge Road, where we began, until the Blinman-Parachilna Road, where we hoped to end up. As camp was about one third of the way along, and time was getting short, we decided to leave the rest for another day. Hot showers were beckoning. Parachilna Hotel is famous for its meals, lovingly referred to as road kill, as they serve all sorts of outback meats not normally found in restaurants. Barry had the camel, emu, buffalo, and kangaroo mixed grill, while I had the roo schnitzel which was to die for. The place was really busy, being Easter Weekend, so it was lucky that we had booked. A nice end to a good day – and a good birthday treat for Julie. Happy Birthday! Today we had a later start. We were doing the Mount Samuel Track, part of Alpana Station, which had an entry point right near our camp, so 9 am was the start time. Once we got the keys and locks worked out, we started the loop drive at the Valley Paddock Gate. 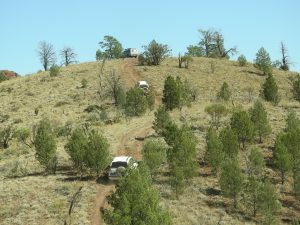 Some of us had done parts of this track previously while helping with the cactus kill, so we knew to expect some proper four wheel driving. With lots of rocky and steep climbs, then descents through shady creek beds, it was a great drive. Then we got to the Mount Buggery Gorge Challenge, a one kilometre stretch through the creek. 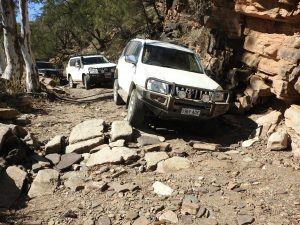 This was certainly low-low driving with boulders, steps, narrow passes by Red River Gums, and plenty of obstacles to manoeuvre around. Very fun! 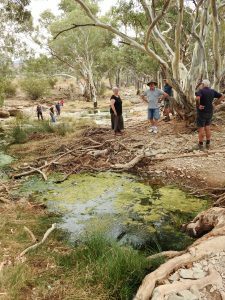 After another ice cream stop at Angorichina Village, we took the creek route home again, entering at the further edge of Ginny’s land, and doing another third of the Oratunga Creek. Dinner by the fire and a nice glass of wine finished the day. Consensus: Mount Samuel Track, and especially Mount Buggery Gorge, has been the best adventure driving so far this trip. Another 9 am start. 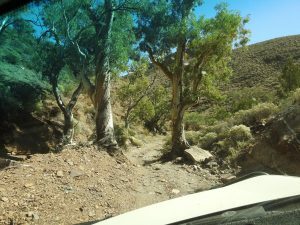 We headed towards Blinman, then on the bitumen to the Nerrina Road, then on to the Artimore PAR (Public Access Route). Passing through station land, we found the Artimore Ruins, a small community of three ruins and yards. The stone work on these buildings was very impressive and beautiful. It must have been incredibly hard work and living conditions. On the way to lunch we passed the track to the Flying Fox mine. Something for later. After lunch under a very big tree, we tried to find the mine. While we could see the flying fox, several tracks just seemed to peter out, and after a couple of false attempts to drive to the site, we parked at the top of a hill and walked down to one digging. No ‘shoe box sized’ lump of gold found at this old copper mine. Heading home, we passed Moolooloo Station Homestead, and were quickly on Glass Gorge Road near camp. Several cars went back to start packing up for tomorrows departure. Trevor & Barb and Barry & Jenny decided to have one last go at the Oratunga Creek run – we wanted to get to the end. So we went back to the point where the creek crosses Glass Gorge Road, as Trevor had not done the first third. We followed them through the creek, past the turn off to camp, towards what we hoped would be the full circuit. But time was not on our side, so we exited the creek at the edge of Oratunga Station again. We will have to come back and finish another time. 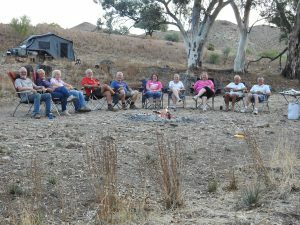 While some of us packed, some of us sat by the final nights fire, enjoying the surrounds. Tuesday 18 April: Departure day. It was decided that we would all leave when we were ready. Deb & Bruce were gone just after 7, and we were last, about 10. We left everything in good order, having cleaned up the fire pit, and done a look around for litter. You would never know we’d been there. A very special thanks to Ginny for her generosity in allowing us the run of her incredible property, and to Ralph Abbot, and those members of the club who have worked hard with him, on the Cactus Cull Project. It stands our club in a very good light when we are community minded and willing to help. And then we reap the rewards. A very good lesson at Easter. And thanks to Barb and Trevor Burford for organising and leading this trip. It was great. And we look forward to another try at the Creek Circuit next time. Thanks also to Peter for photos included in this report.